David Charbonneau, a professor of astronomy at Harvard, grew up in a family of scientists. He was always interested in astronomy, he told Business Insider. Even as a kid, he would carry star charts with him on scout trips. So, it seems natural that he would pursue a career in science, studying maths and physics as an undergraduate student and then entering the astronomy program at Harvard for graduate school. 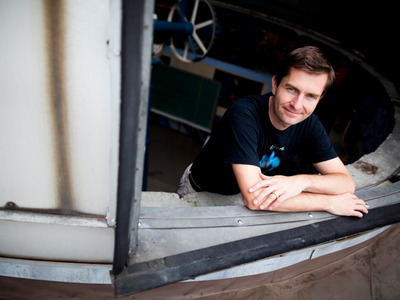 Now, Charbonneau’s work in detecting exoplanets has earned him a place as one of three 2016 Blavatnik National Laureates, an award given by the Blavatnik Family Foundation and administered by the New York Academy of Sciences to honour “the nation’s most exceptional young scientists and engineers.” As a laureate, he won $250,000, which is the largest unrestricted cash award given to early-career scientists. Maybe it was fate, but just as Charbonneau began graduate school, astronomers indirectly detected a planet orbiting a star for the very first time using something called the Doppler method. So, Charbonneau decided to jump in the field, he said, and he never looked back. Charbonneau’s work in the field led him towards making the first direct detection of a planet transiting (passing in front of) its star. Instead of simply learning that planets existed, he said, we could suddenly begin to actually characterise them and measure their properties. He is especially excited about the possibility of inferring the existence of life on another planet. He thinks that the way we’re going to be able to do this is by thinking about how aliens would study all the planets in our solar system. These alien astronomers, he says, would notice that something is really different about Earth. They would see that Earth’s continents are green, instead of brown (like they would be if only bare rock). Also, they would also see strange gases, like oxygen and methane, in Earth’s atmosphere — chemical fingerprints that signal the presence of life. Humans have thought about whether we were alone in the universe for a long time, Charbonneau said, but we’ve never had the technological ability to actually find out. But now, he thinks, we might finally be able to to pull it off.